Over the unofficial Melbourne Cup long weekend in 2018, the Crafty Pint crew and friends were joined in the campsite by the family behind Sailors Grave. Thus we had access to a beer fridge larger than a coffin and the sort of low ABV fruity refresher ideal for long, lazy days (not to mention some quite spectacular dancing, but that's for another occasion...). Tucked at the bottom, underneath the various cans, was a mini-keg filled with a yet-to-be-released beer: their submission for the Carwyn Canvent Calendar. 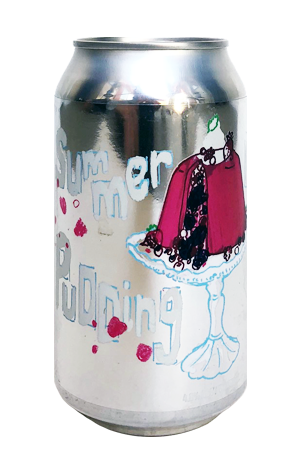 Calendars now long opened, Summer Pudding is doing the rounds on a wider scale and is a beer that lives up to its name. It's the boldest of pinky-red hues and keeps its creamier and acidic sides pretty much buried under an avalanche of juicy berries: 100kg worth of blackberries, boysenberries, raspberries and red and blackcurrants to be precise. Back at Lost Lands, while the keg was confined to the campsite, it's fair to say it received a serious workout.